Understanding the real world based on visualisation and prediction is essential for the decision-maker. We build a computational virtual reality environment to improve visualisation, understanding and prediction of the physical world and to guide action. 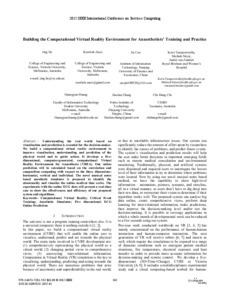 It develops a five-dimensional, computer-generated, computational Virtual Reality Environment for Anaesthesia (VREA). Our online prediction will be calculated based on the correlation and composition computing with respect to the three dimensions: horizontal, vertical and individual. The novel musical notes based anesthetic simulator is proposed to identify the abnormality and visualize the online medical time series. The experiments with the online ECG data will present a real-time case to show the effectiveness and efficiency of our proposed system and algorithms.